1 of 6 Heat oven to 375 degrees F. Coat 9-inch glass pie plate with nonstick vegetable-oil cooking spray. 2 of 6 Set aside 1 cup of cookie dough. Knead flour into remaining dough. Press dough over bottom and up sides of prepared pie plate. Prick all over with fork. Line with foil; fill with dried beans or pie weights. 3 of 6 From remaining 1 cup dough, roll 1 tablespoon dough into ball; repeat for total of 12 balls or cookies; place on ungreased baking sheet. 4 of 6 Bake the cookies and pie shell in 375 degree oven for 10 minutes. Carefully remove the aluminum foil and weights from the pie shell. 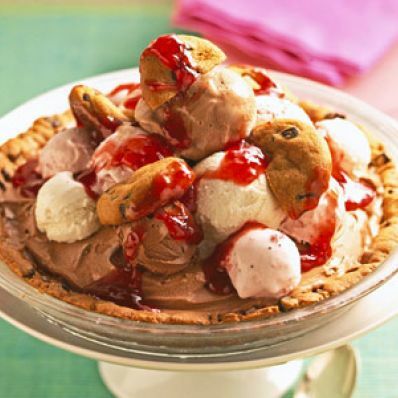 Bake cookies and pie shell another 5 to 8 minutes or until lightly browned. Cool the cookies and pie shell completely on a wire rack. 5 of 6 Crush 4 cookies. Break remaining 8 cookies into halves or quarters. Once shell has cooled, scoop half of each pint of ice cream into shell, alternating colors and stacking as you go. Sprinkle crushed cookies over top. Continue scooping and stacking remaining ice cream. Tuck cookie pieces in between scoops. Freeze for 4 hours or until the pie is firm. 6 of 6 To serve, gently heat jam in a small saucepan or in a bowl in a microwave oven until spreadable. Let cool to room temperature. Transfer to small plastic food-storage bag; snip off corner; drizzle over pie. Or spoon jam over pie. Let stand at room temperature until easy to cut into serving pieces, about 10 minutes. Makes 12 servings.